I first took the amount of money it cost per person and put x on that number. X represents the amount of people, so when you multiply them together you will get the total cost. Then I put the set-up as the y-intercept or b. Yes, first you have to put it in equation form(9.25x+61.25=10x+20) Then, you have to subtract 9.25x from 10x to get .75x+20=61.25. Then, you subtract 20 from 61.25 to get 41.25. Then, your equation would be .75x=41.25, then you would divide 41.25/.75 to get 55. Then if you have 55 people then it would cost $570.00. 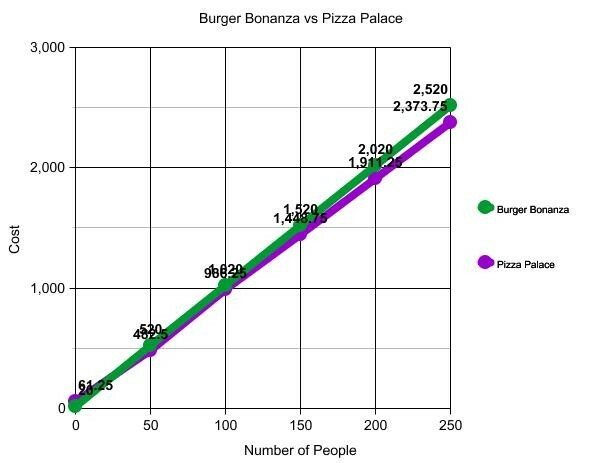 For Burger Bonanza, the maximum number of people would be 98 and the maximum number of people for Pizza Palace would be 101. You can not have a fraction or a decimal because you can't have a fraction of a person. The better buy is pizza palace because each of pizza palaces prices, if you buy 2 or more is less than Burger Bonanza's Prices. Describe how you created each equation. I created each equation by putting the amount it cost per hour multiplied by the number of hours to get the total Cost. Then, I put the set-up fee as the y-intercept or b. 3. If you only have a budget of $750 for the bounce house, how many hours, maximum, would you be able to have at the 7th Grade Blowout for each company? Can you have a decimal or fraction as part of your answer? Why or why not? 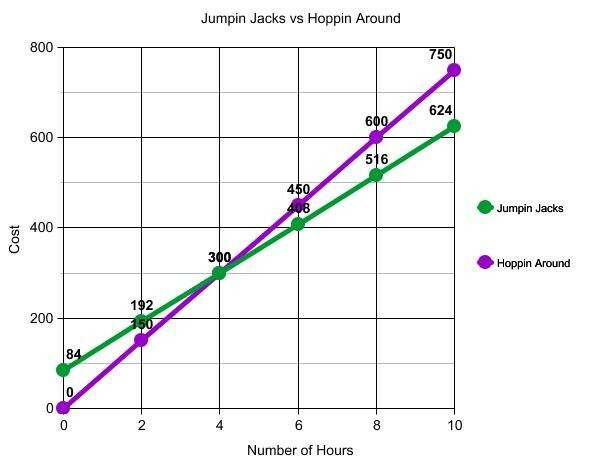 The maximum number of hours for Jumpin Jacks is 12.3 hours and the Maximum number of hours for Hoppin Around is 10 hours. Yes, because you can have an hour and a half or something like that. Proposed Plan: The better buy is umping Jacks if you get more than 4 hours but if you get less than 4 hours than Hoppin Around is a better buy.